One of the more common questions I get at this time of year when everything is dormant is when, and how, to prune various fruiting plants, like peaches, blackberries, figs and blueberries. In general, January and February is an ideal time train and trim most of our orchard fruits. Each type of fruit is trained and maintained differently, and so it is helpful to know some general guidelines for what you are growing. Fig trees can get a lot taller and wider than anticipated. Selective thinning can reduce height without pushing out vigorous growth. For example, figs are NOT annually pruned to enhance fruit production, whereas peach trees need an annual pruning to maximize their potential for harvest. I cannot provide detailed pruning information in this short column for each of the commonly grown fruits, but will discuss some of the more common questions. Figs. Let’s start with an easy one. As I mentioned already, fig trees do not require annual pruning. As a matter of fact, pruning too much now can reduce your harvest. But a common complaint is that the tree has grown too large to easily harvest. One option is to do as some homeowners, and place a cheap step ladder under the tree during harvest season to extend your reach. If your goal is to reduce the size of the tree, do it in stages over a period of a few years. Prune out one or more of the largest trunks, leaving several others alone. Many new shoots will grow this year from those cuts and become future bearing wood. Next year, remove some other major trunks. Over a period of a few years, you will have shortened the overall height and spread of the tree. During the summer, you can thin back some of the longest branches to keep the tree height more manageable. Blackberries. Blackberry canes live for two years. The first year, new shoots emerge from the ground during the growing season. These shoots (called primocanes) will produce berries the following year, in 2015. After they bear fruit, they die, and can be removed at that time. So, in a managed berry patch, you will have both primocanes, and fruiting canes (called floricanes). If you have never pruned out dead canes, it can be difficult in the winter to tell the difference between dead canes and floricanes. If that’s your dilemma, put a bit of spray paint at the base of everything now. Later this summer after harvest, it will be easy to spot which canes can be removed. Tip back vigorous primocanes during their first year to make them bushier, and have more fruiting wood for next year. Blueberries. Most blueberry varieties reach mature size in 7 to 8 years, growing up to 15 feet tall and 10 feet wide. The bush will consist of many trunks that develop from the base. Thin out any overly vigorous upright shoots several feet from the ground to keep the center of the bush open and to keep the bearing area within easy reach. As they begin to age and form thick, gray branches, begin thinning at ground level about 20 percent of the branches every year. This thinning encourages new, productive shoots to emerge from the crown area, keeping the plant younger and smaller. Peaches. Of all the fruit trees we grow, peaches require the most annual attention. 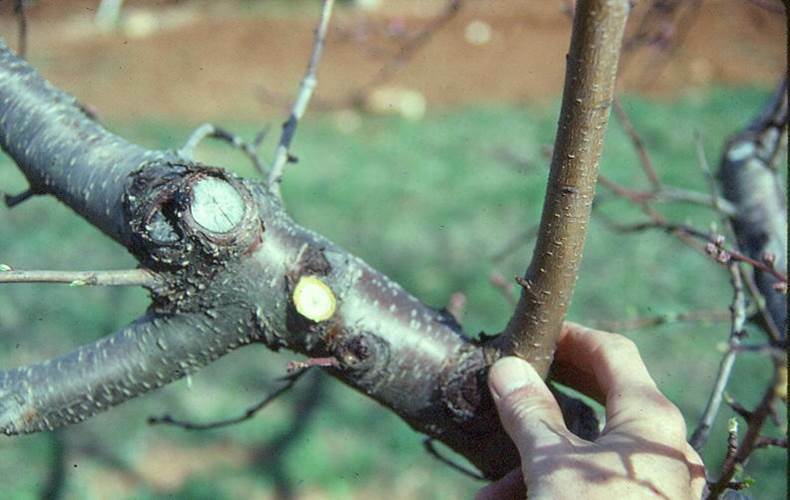 Proper pruning of peach trees, starting from the day they are planted, helps keep trees to a manageable harvest height and maintains the health, vigor and productivity of the trees. It is much more convenient to harvest succulent peaches standing on the ground rather than balancing on a tall ladder to gather fruit 10 feet or higher above your head! 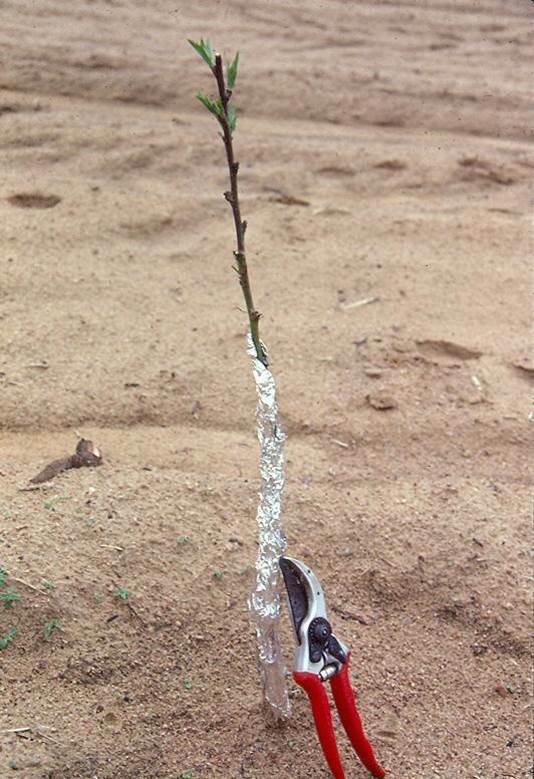 Newly planted peach trees should immediately be cut back to about 24 inches tall. Several branches will develop near the cut during the spring. During the summer, select three or four well-spaced, wide-angled branches to form a bowl-shaped framework of scaffold branches. If growth has been vigorous, cut these back to about 24 inches from the main trunk to force new side shoots. These new shoots will become the secondary main branches, creating a strong framework from which most fruit wood will be produced. Remove all suckers sprouting from the base of the tree. 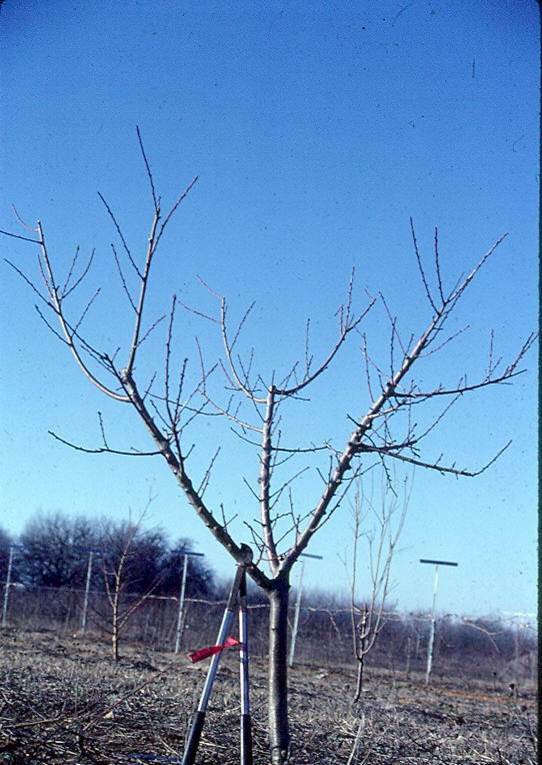 Training during the next few years after planting depends on the tree’s rate of growth. Remove vigorous, upright shoots and larger branches that grow into the open, bowl-shaped center of the peach tree. Leave enough short, leafy growth and fruiting branches on the interior to prevent sun scald of the main scaffold branches. On bearing trees, clip shoots coming off of the secondary main branches and other branches to maintain a practical tree height, about 7 to 8 feet tall. Fruit are produced on 1-year-old shoots, so there must be plenty of new growth every year. 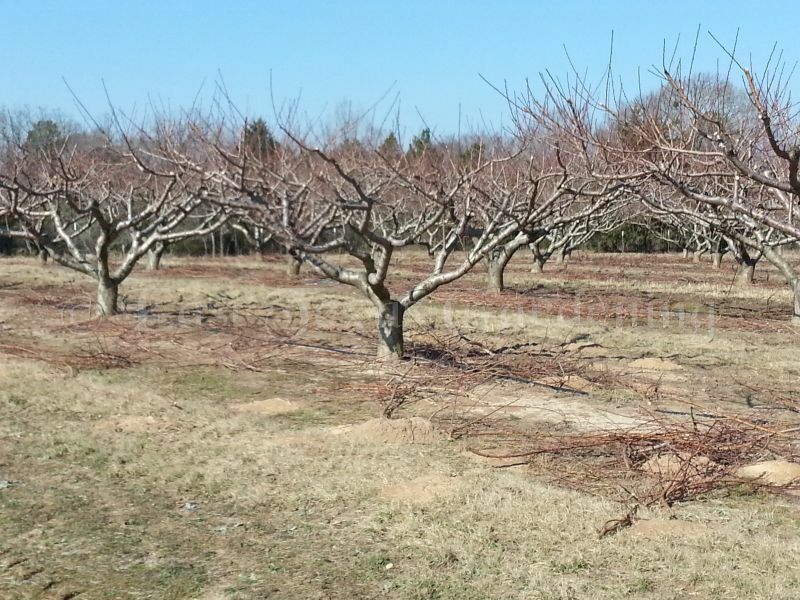 The 2015 peach and plum crop will be produced on wood that is produced this year. Yearly pruning helps stimulate this new growth. Remove old gray-colored, slow growing shoots which are not fruitful, and leave one-year-old, red, 18-24 inch long bearing shoots for this year’s crop. Yes, you will be removing some of the fruiting wood for this year, but this is a good thing because peaches tend to overbear, so this helps thin the crop. 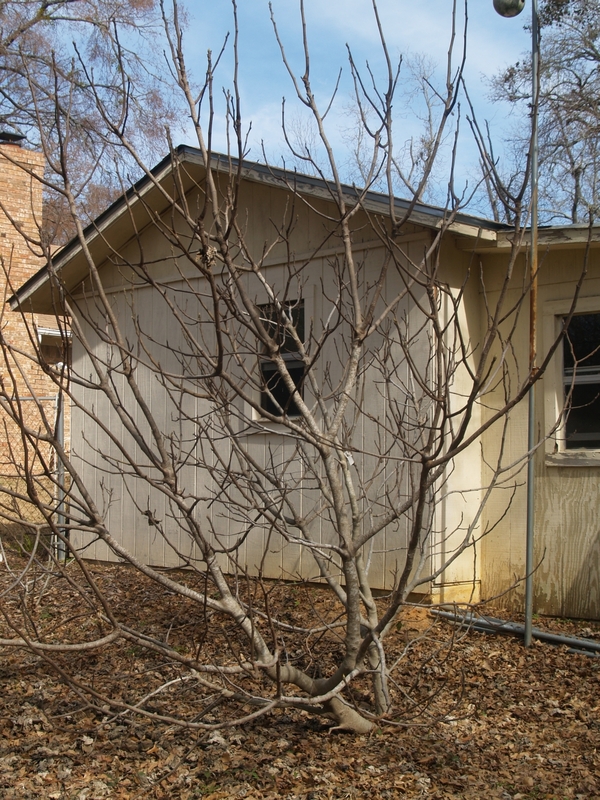 Yearly pruning is also needed to keep the center of the peach tree free of excessive growth. Light is critical for development of fruit wood and flower buds, and good air circulation in the center of the tree is important to help reduce disease problems. For more information on specific fruit crops, see the Fruit & Nut Resources section on Aggie Horticulture website. 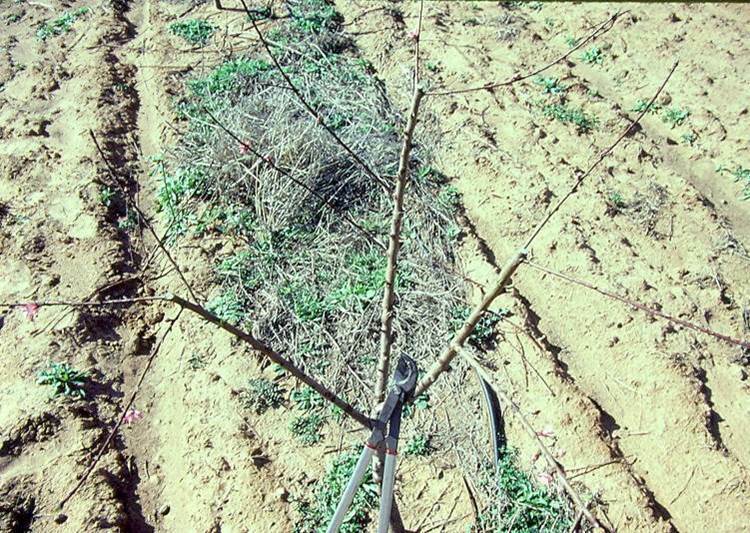 Properly trained peach trees with an open center, after annual winter training.